The debate about development in Fremantle made me wonder what good change or bad change is. Some people are frightened off change while others embrace it happily. I guess that most people in Fremantle agree that the city needs development, needs to grow and grow-up, and there would only be a few who believe we should leave it as it is. But while we embrace change we’d prefer if it did not happen in our street or suburb, but somewhere else more appropriate, as we would put it. We polarise the debate and create an us-and-them attitude. “They” are being pushed by developers while “they” are anti-development. We don’t accept that councillors might simply be pro-future, pro-progress and pro-change. We debate height, but not beauty, and even less the social impact of development. Do we know that what is proposed for Fremantle is what it needs, and has council thoroughly done their homework. Can we trust them with our future? Change, or progress, is often difficult to accept. While we readily embrace changes in technology we are reluctant to be positive about changes to the places we live in, but nothing remains the same ever. Fremantle changed when Notre Dame University came to town, and while the good change is that they have renovated and looked after many historic buildings very well, the bad change is that they took social life out of the west end, with the closure of the many pubs along High Street. I can no longer have a Friday night pub crawl there with only the Orient Hotel left open. Change has to start somewhere though. I don’t imagine that the people of Paris were all that happy about the Eiffel Tower when it was built, or the people in New York having street parties when the first high rise there was proposed, but they are now two of the stunning cities in the world. One only has to go to Europe to see how well old and new can coexist and how well stunning new building can blend in with historic streetscapes. Of course there are also lots of examples of very bad development all over the planet, and we hopefully learned from them. Change means treating the past with respect, acknowledging that history connects the present with the future, and foremost, change needs to be implemented only when the social impact of it has been analysed and debated. See what change has done to our lives. No one would want to go back to the old wireless radios, or the small b&w televisions sets. Mobile phones are good change, but what they do to our manners has been bad. We text and talk on the phone while in company of others. Computers and the internet have made amazing changes to our lives, but we spend far too much time on them, rather than meeting people face to face. New technology has been good but also taken the romance away. Instead of writing glowing love letters to those we adore, we send them texts or emails. The reality we need to live with is that change has got good and bad sides. Accepting mediocrity is no way of developing Fremantle, but good new buildings would enhance our city and create the vibrancy that has been lacking. Procrastination is not an option, we need to move on and modernise our city, and we need to accept that younger people have different views of what is good for Freo than old ones do. Quiet night streets are not inner city living. Those who need that also need to move on. I am optimistic about the city I love. Let me express it in modern language. Life is gr8. LOL Freo! The family and friends of David Ngoombujarra Starr would love you to join us for a Memorial Service and celebration of a remarkable life. Sunday September 25. 12-2 at King’s Square. 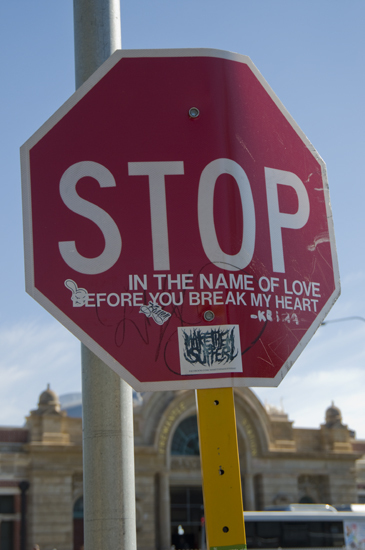 Fremantle. philth5@me.com if you would like to contribute, with an idea of what time would best suit you and/or any special needs. Please note there will be a family audience. There will be an opportunity for all to talk briefly about David. If you have any particular desires for this let us know. might be attractive. Please email with your gift ideas. We envisage this day as a celebration… more a party than a service. Please note the event is Grog and Smoke Free. Who is the very intelligent, vibrant, energetic and gorgeous woman who is going to give Ivan Dzeba a run for his money at the Fremantle council elections? I’ll let you know as soon as she tells me I can release her name 5>). Living in anticipation is always good, and even more so when it would be just great to have such a talented and creative person on council. GO ……!! And rumours are that Bill Massie will be standing again after all, although he was unsure about it only four weeks ago. What about Donna Haney. Will she throw her hat in the ring one more time? Let me know if you hear any gos on it. 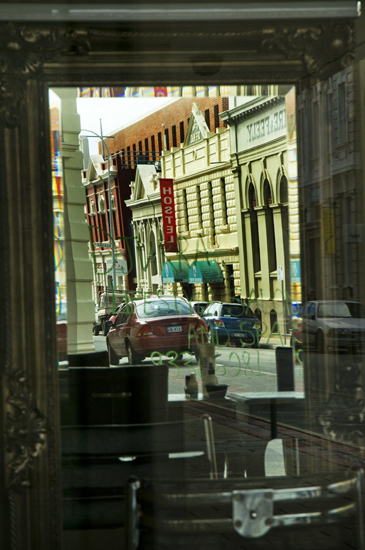 Normally the beautiful mirrors at DJURRA in Fremantle’s High Street show the reflections of gorgeous women who are having their hair done, but when the chairs are not occupied the mirrors reflect the beauty of the city’s west end historic buildings. All sails are set for the ISAF 2011 Sailing World Championships off Fremantle’s Bathers Beach later this year, with the city hosting a 16 day festival on the Esplanade. It will have over 200 free events and will also hold a major concert on December 3. Market stalls, a main stage and a kid’s zone will join the big Ferris Wheel, which will be put up in late October. The huge spectacle will coincide with this year’s Fremantle Festival, so there is a lot of fun ahead for the port city. The arrival of the replica of the Fremantle built Endeavour on October 12 will start the celebrations for this world event, which are the qualifying races for the 2012 London Olympics. There appears to be a new and more positive attitude in Fremantle lately, with lots of small improvements and innovations all over town. New burger and small wine bars are popping up, Kidogo Art House had a face lift and looks stunning, while work at Bathers Beach seems to be slow but is happening. New bars for Pakenham Street have been approved and will hopefully open in the near future. 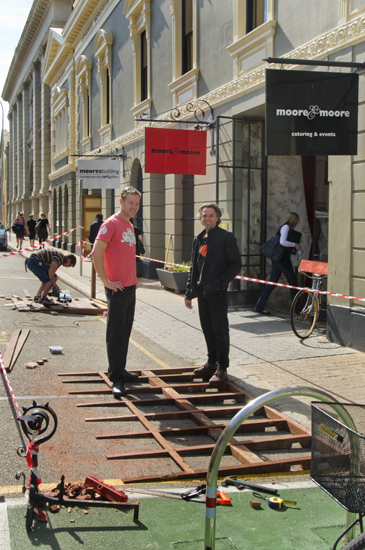 At the Moore&Moore cafe in Henry Street work started today on the outdoor decking for alfresco dining, much to the delight of owner Simon Naber and Moores Building Art Centre manager Richie Kuhaupt. Simon is happy to have a place where people with dogs can come again. Two of the three recently installed bike racks will be relocated, so they will be on both sides of the new decks, while the loading bay will also get a new spot, which will please the neighbours next door. Living in Fremantle means you have to be nothing but an incurable romantic of course, and a sense of humour helps to get over broken hearts. Beautification of Pioneer Park opposite the Fremantle Railway Station started with the addition of flower beds and new trees planted on the corner of Market and Phillimore Street. It is starting to look like a real cute park now and a few more seats in the grassed area would be a good idea as well. 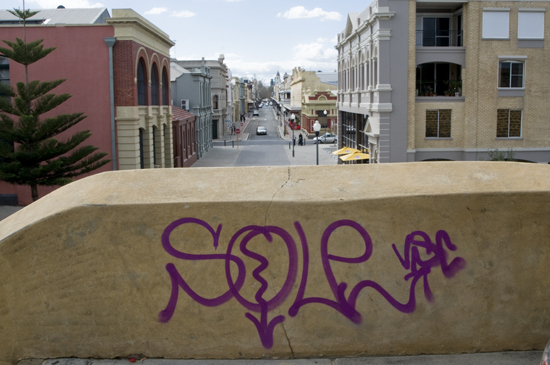 Some idiot left his mark over night at the historic Fremantle Round House with this graffiti tag. I have absolutely no understanding for this mindless, senseless, stupid, dumb, idiotic, selfish, disrespectful, antisocial behaviour, and hope the police will catch this moron and let him pay for his vandalism. What goes on in the brains of these sort of people. Only yesterday we saw the senseless destruction of headstones at a Perth cemetery. Have they got nothing better to do, and what satisfaction could this possibly give them? Grow up, you morons. Read a book or do community work if you are so bored with life!